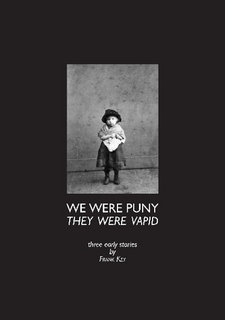 Thin and spineless, We Were Puny, They Were Vapid is the fourth Hooting Yard book now available from Lulu. Volume One in a projected series of Out Of Print Pamphlets Reprinted, it contains three stories from before Mr Key’s Wilderness Years, together with recently discovered illustrative matter by Dan Chambers and a brand new bit of prefatory twaddle from Mr Key himself. So go and buy it, right this minute. Note to subscribers : Those of you who have subscriptions at Old Halob level or above will receive a signed and dedicated copy, brought to you by your postie. To ensure delivery, please send an email giving me your current postal address (even if you think I already know it), and be patient while I get so complicated a business organised. Note to putative subscribers : Anyone taking out a subscription at Old Halob level or above by 31 December 2009 will also receive a signed copy. I’ve placed my order … Christmas shopping sorted out in a moment … thanks, Mr Key. Well I hope Lulu send them out in time for Christmas. Many thanks for your sensible purchasing decision. As the proud possessor of almost all your valuable Out Of Print Pamphlets, I cannot tell from the feeble description whether or not I already own the three stories contained within this volume. Please name them so I can put my mind at rest. Guy : The stories here gathered are “The Book Of Gnats”, “The Phlogiston Variations” and “The Big Metal Fence”. In spite of the collective subtitle “Out Of Print Pamphlets Reprinted”, none ever appeared in pamphlet form. The first two were included in editions of Indelible Ink’s “Massacre” anthology, and the third is previously unpublished in paper form anywhere, ever. How typical of your approach. I should have known. I will of course purchase it immediately.